The federal government is engaged in surveillance of electronic data transmission to a more massive extent than most people would have guessed, and much of it is almost assuredly outside of Fourth Amendment requirements of probable cause and a specific warrant. The Electronic Communications Privacy Act of 1986 (ECPA) is the main federal law that governs data stored electronically, including email, business data, your photographs, social media, etc. But ECPA literally predates the Internet, so it predates the widespread use of home computers, email, and social media. It predates cloud storage. Almost any 30 year-old law probably requires updating, but ECPA is so out-of-date that it demands it. Because ECPA is so outdated, right now virtually all of your electronic life is subject to warrantless search and seizure. Here’s the good news: Short of resolving these major disagreements over the NSA, FISA courts and warrantless wiretaps, Congress can still make a down payment on Americans’ electronic privacy. As proof of its bipartisan appeal, Sen. Pat Leahy (Vt.), a liberal Democrat, and Sen. Mike Lee (Utah), a Tea Party Republican, have co-sponsored legislation to bring ECPA up-to-date with current and future communications technology. 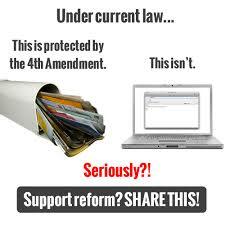 Updating ECPA for the Internet Age would allow Congress to show that it is sensitive to Americans’ privacy concerns and to reaffirm Fourth Amendment protections. It would clarify the law so that law enforcement agencies could obtain access to what they need by following proper, constitutional procedures, and it would protect individuals and small businesses that do not have the resources to navigate the ambiguities unnecessarily created by the current ECPA’s outdated provisions. It would give users of cloud services confidence that the data they upload has at least basic constitutional privacy protections. And it would give Congress an opportunity to work together and actually get something done that the American people would almost universally see as beneficial to their daily lives.